The Sheriff’s office is responsible for more than 1,000 firearms confiscated from accused batters due to Protection From Abuse orders. Their office’s Warrant Unit can execute Protection From Abuse orders signed by a judge 24/7, Williams said. Just obeying orders, like cops everywhere will do when pressed. The operable phrase here is “alleged.” It’s in the title of the article, I didn’t make it up. So we don’t have to imagine anything. All it takes is an accusation or allegation. Presto. God-given rights to self defense abused in a flash. One phone call, one statement to a judge, one allegation to a social worker, true or not. But no one is making a judgment, of course. Remember that. If you do not present a danger to yourself or others and are acting lawfully, there should be no reason to be concerned. 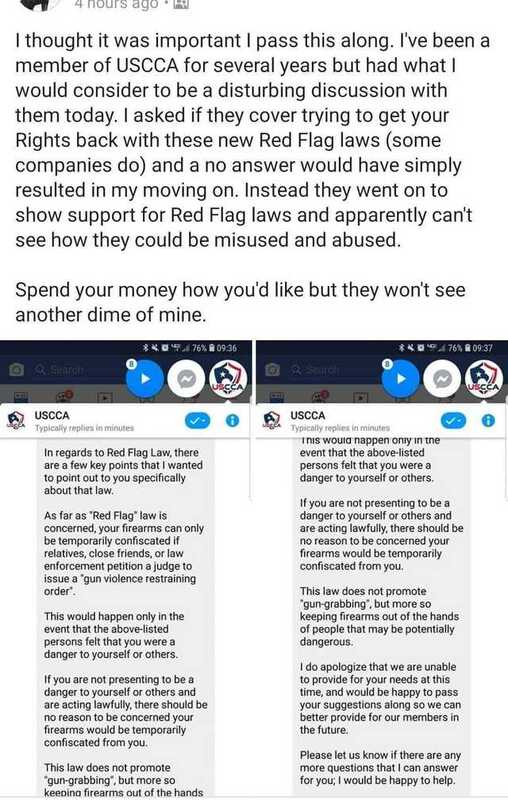 Unlike, say, if you lawfully defend yourself and the prosecutor wants to put you in prison anyway because the system is abused, necessitating a high-powered second amendment lawyer paid for by your USCCA dues. That’s the only situation where abuse happens. Or perhaps they know there will be abuse, and it’s another chance to score membership dues from the sheeple. People will need those high-powered lawyers to get their guns back when they’ve been falsely accused of something. What a bunch of hypocrites. Hey, USCCA. If you’re not careful, you’ll take up the mantle from the NRA as the most well-connected and well-financed gun control organization on earth. Would that make you proud? Philip Williams hid the 100-year-old weapon in a lock-up in Oakenholt, Flintshire, Wales and claimed he forgotten about it after unearthing it in a crate he was left to look after by an unknown farm worker. But Mold Crown Court heard he moved the gun around to another storage unit in Tranmere and painted the handle to prevent it from rusting. Meanwhile his son, Daniel Williams, posed for a selfie holding the gun on one of the two occasions he came into contact with it. Possession of a firearm carries a minimum sentence of five years imprisonment, but the Judge Niclas Parry heard arguments for exceptional circumstances in both cases and reduced the men’s jail terms. He jailed Philip Williams, 64, for two years while Daniel Williams, 34, received a one-year custodial sentence. Williams Snr said he did not own the Smith and Wesson and it fell into his arms after he agreed to look after some crates for a man he knew only as “Patrick” who worked at a farm in Bodfari where he was living at the time. He claimed it was only after when he learnt that the man had died while on holiday when he discovered the weapon buried in one of the crates given to him by Patrick. But instead of handing it over to the police, he kept it for two-and-a-half years, storing it in a lock-up in Tranmere before then moving it to the unit at Oakenholt, police paid a visit on March 10 last year. Barrister Michael Whitty, prosecuting, said police executed a search warrant at a unit at Pandy Garage after receiving information and found the 0.22 calibre gun wrapped in a tea towel hidden under the wheel arch of a caravan. Since it’s a hundred years old and a .22, I’m guessing it’s a revolver. So two men went to prison for a total of three years for having a .22 S&W wheel gun. Because, you know, Pakistani child grooming gangs are okay with the crown, but you can’t have guns. That might be a danger – to the elitists.